Nonetheless, I was pretty stoked when I found out that Tony Hawk’s organization chose MapifyPro to showcase their skatepark maps. Since 2002 the Tony Hawk Foundation has been fulfilling its mission to help young people by issuing grants to low-income communities building quality public skateparks, and providing guidance to city officials, parents, and children through the process. To-date, the foundation has awarded over $5.7-million to 588 public skatepark projects in all 50 States, and $100,000 to support the Skateistan program in Afghanistan, Cambodia, and South Africa. That’s pretty incredible. Feel free to dig in even further by checking out the video below. The THF map is packed with over 600 locations, each showcasing a fully funded and available skate park. Tony and crew believe that kids need a place to grow in a safe and positive environment with like-minded friends. Engaging the community is key, and their implementation of MapifyPro makes it simple to find a nearby skatepark. Six million visitors annually enjoy skateparks that the Tony Hawk Foundation helped fund. MapifyPro neatly organizes over 600 locations. The clusters feature prevents the map from becoming too complex. Details on funding, addresses, and other location-specific details are contained on every location. This not only makes it simple to research various skateparks, but showcases just how much impact THF has had on communities across the country. You can check out the Tony Hawk Foundation’s map right here and see why MapifyPro is the perfect match for community-driven maps, just like Tony’s. Get your copy of MapifyPro here. The Best Maps for Shopify? We Have you Covered. The Best Maps for Shopify. Period. Last year we released a fully-featured version of MapifyPro for Shopify, and it has continued to grow in its customer base. Check out our video below for some fun info on the new Shopify mapping app, or see the working demos here. MapifyPro provides every cutting edge feature you’d expect to build the perfect store locator. However, it goes beyond this and can solve the issues faced for any map-based project. The features included make for a stellar experience for both you and your customers, and will drive traffic to your site AND physical locations. When you add a store locator to Shopify, you want your locations to be found. Our advanced search and filtering features will make it as simple as possible for your customers to find your locations. Provide directions, create custom filters based on any topic, search by radius, and more! We don’t limit you in any way. Unlike other mapping apps for Shopify, we offer one pricing plan with absolutely zero limitations. Focus on your business instead of worrying about traffic, limited locations, or other limitations. Try MapifyPro for Shopify Risk free for 7 days. Don’t like it or it’s simply not the right fit? Simply uninstall and you won’t be charged. And that’s just a small snippet of what’s included. Check out the full overview here. Sure, you can build the most powerful store locator available for Shopify, but MapifyPro is perfect for ANY mapping project. Showcase your travels, highlight points of interest for your fitness club, point out the perfect hiking paths… The possibilities are truly limitless. Give MapifyPro for Shopify a try over here at no risk. We think you’re gonna like it. 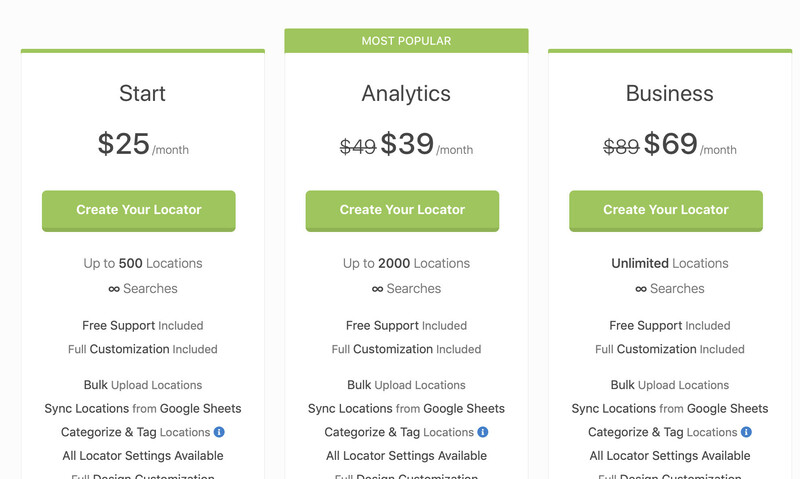 You may have noticed that late last year we switched to a monthly pricing model for the MapifyPro store locator for WordPress. After doing so, we understandably received questions on why we decided to do so. After all, many customers are accustomed to plugins sold on marketplaces like CodeCanyon, where plugins are typically sold for a one-off cost as low as $5. The short answer to this is that MapifyPro outgrew that model quite some time ago. Though there are some great plugins on CodeCanyon (we even have a few up there), for the most part it boils down to the fact that it is essentially filled with buggy, unmaintained, and simplified plugins that don’t hold a candle to the capabilities of MapifyPro. MapifyPro, the software itself, has cost over $25,000 to develop, and that doesn’t even consider the Shopify version. That means if you wanted to hire a development team to build the exact same map plugin for WordPress, then you’d have to invest at least that amount, and that doesn’t count for the prototyping and design, which I took care of myself. At $19 per month, it would take you over 1300 months (109 years) to reach that cost. 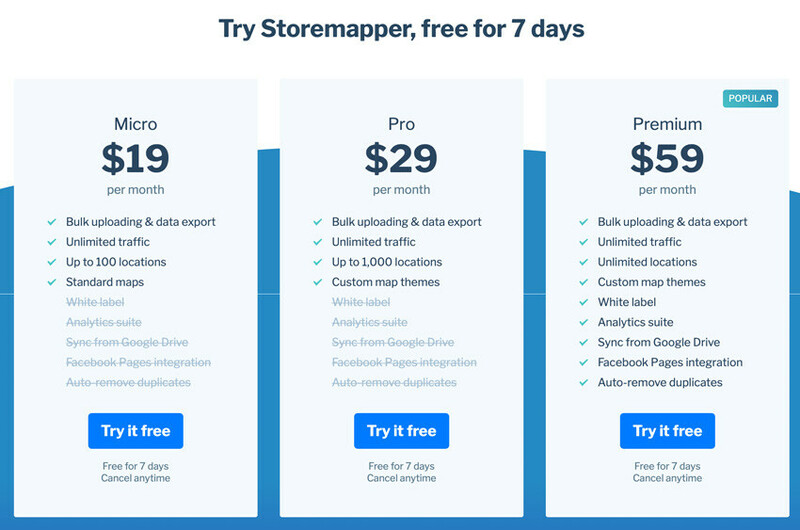 Storemapper: $19/month for the cheapest plan, which is very limiting in locations, AND site traffic. That’s a lot to monitor, and to unlock it you’ll be paying $59 a month. With Mapifypro we don’t mess with limitations: you simply get unlimited functionality for one low price. StorePoint.Co: StorePoint bumps up to $25 for the minimum usage, and unlocks the full features at $69/month, and these are their sale prices. StoreLocatorWidgets: Also similar to the previous 2 examples, with the very basic and limiting plan at $19/month, and full access at a blistering $199 per month! With some Googling, you’ll see that this is a common model, and also see that MapifyPro is actually one of the most feature-rich solutions out there, with zero limitations, and more features than the competition. Even more important, it allows us to engage with customers more, add requested features, and provide the ultimate support scenario with our new team of support agents, who we are actively interviewing at the time of publishing this article. For these reasons, and those shared by current customers, we hope you see the value and how MapifyPro is the best store locator plugin for WordPress.